In 1886, the Society decided to bring together all its London activities (with the exception of the Little Coram Street Ragged School) at a single location. After no suitable premises could be found, a site was purchased on the recently constructed thoroughfare of Shaftesbury Avenue and an architect was commissioned to design a new building. On 17th June, 1887, the Prince of Wales laid of the foundation stone of what was originally to be known as 'The Jubilee Memorial Home' in honour of Queen Victoria's Golden Jubilee. The ceremony was attended by 400 children from the Society's various establishments and music was provided by the boys' band from one of the homes. 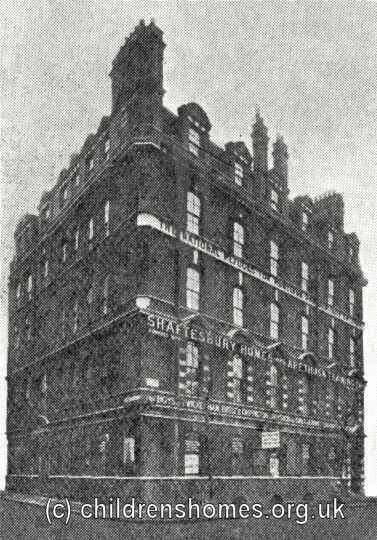 By the time that the Countess of Jersey formally opened the completed building on May 15th, 1888, it had adopted the name Shaftesbury House, with the address of 164 Shaftesbury Avenue. The premises included accommodation for 100 destitute boys and 35 working boys, together with a club, institute and offices for the Society. The Working boys' department was renamed Fordham House in 1892 in memory of John Fordham, a long-serving Treasurer of the Society.